On the 50th Anniversary of his Transitus (passage into heaven). Who was the greatest theologian of the twentieth century? Many, seduced by the glamour of personality (which obtains even among theologians), would answer Karl Rahner SJ. But some who know how ferociously certain pre-Vatican II thinkers were buried by the liberals and reformers would look elsewhere entirely. One who loomed like a giant was Pére Garrigou-Lagrange, OP who is now being slowly rediscovered, not least by Fr Aidan Nichols, OP who has accepted a new lectureship at Oxford University in part to reassess his work. Here Fr Thomas Crean OP introduces Garrigou-Lagrange's life and thought. John Henry Newman, in his Plain and Parochial Sermons, said this: "Great saints, great events, great privileges, like the everlasting mountains, grow as we recede from them." As we leave behind the twentieth century it becomes easier for us to see who the great men of that time within the Church truly were, and any list of such men would surely include the French Dominican theologian, Reginald Garrigou-Lagrange. Father Garrigou-Lagrange's works would once have been highly esteemed by seminarians and theologians alike; after the Second Vatican Council they fell largely into neglect, but more recently there have been some small signs that he is being read again, e.g. a new book published by an American Dominican introducing his life and work, and the inclusion of his name among the lecture topics scheduled for this coming year at Oxford University. Gontran-Marie Garrigou-Lagrange was born in 1877 into a solid Catholic family living in the south-west of France. In 1896 he began studies in medicine at the university of Bordeaux, but whilst there he read a book by the Catholic philosopher Ernest Hello which changed the direction of his life. Years later Fr Garrigou described the impression this one book made upon him: "I glimpsed how the doctrine of the Catholic Church is the absolute Truth about God, about His inner life, and about man, his origins and his supernatural destiny. As if in an instant of time, I saw how this doctrine is not simply 'the best we can put forward based on our present knowledge', but the absolute truth which shall not pass away..."
To this intuition the young university student would remain faithful for the remaining sixty-eight years of his life. Medical studies abandoned, Gontran-Marie entered the French Dominicans at the age of twenty, and received the religious name Reginald. (Blessed Reginald of Orleans was a contemporary of St Dominic: our Lady appeared to him in a vision, cured him of a mortal sickness and gave to him a white scapular that thereupon became part of the Dominican habit.) 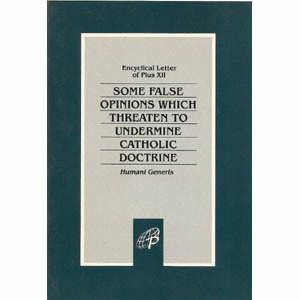 Friar Reginald had the good fortune to receive his initial training from Dominicans committed to implementing Pope Leo XIII's encyclical letter Aeterni Patris, the document that insisted upon the unique place of St Thomas Aquinas in philosophy and theology. It was by studying the angelic doctor that the young Reginald Garrigou-Lagrange nourished the conviction that had brought him to the cloister: the unchangeableness of revealed truth. His superiors clearly perceived his abilities, for after ordination in 1902 Fr Reginald was enrolled for further philosophical studies at the Sorbonne in Paris. It was a mark of the trust that his superiors placed in him that he was sent to so aggressively secular an environment while still a young priest. Among his lecturers were Henri Bergson, Emile Durkheim, and the not yet excommunicated Alfred Loïsy, 'father of Modernism'. His fellow students included the future philosopher Jacques Maritain, not yet a Catholic and indeed driven almost to despair by the prevailing nihilism of the great French university. Father Garrigou's relations with Maritain were later to be both fruitful and troubled. In 1906, Fr Reginald was assigned to teach philosophy at Le Saulchoir, the house of studies of the French Dominicans. His pedagogic skill was such that in 1909, at the age of thirty-two, he was sent to teach at the Dominican University in Rome, the Angelicum. Here he remained for the next fifty years, teaching three courses: Aristotle, apologetics and spiritual theology. He had the gift of making the most difficult subjects clear, and of showing how sound philosophy and revealed truth fit together in a wonderful harmony. 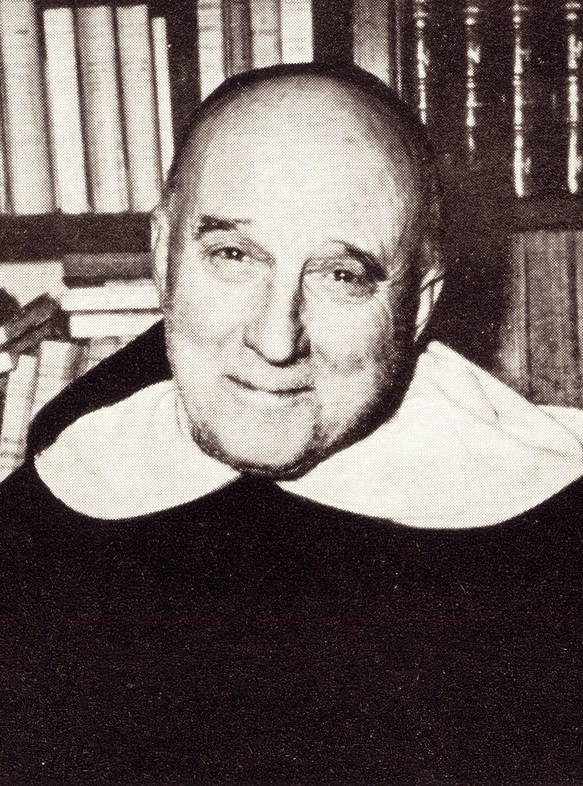 Father Garrigou clearly loved his work: one of his students remembered him exclaiming, "I could teach Aristotle for three hundred years and never grow tired!" He also possessed what is perhaps the rarer gift of communicating his own zest for a subject to his listeners, for his lectures, abstract though they were, were not dull affairs. One student paints this portrait of Fr Garrigou lecturing: "His small eyes were filled with mischief and laughter, his body was constantly moving, his face was able to assume attitudes of horror, anger, irony, indignation and wonder." Reginald Garrigou-Lagrange was by nature and conviction a controversialist. He believed that the theologian's task was not simply to teach Catholic doctrine but also to be, in the scriptural phrase, a watchman, on guard against whatever might undermine it. In the spirit of St Pius X and his encyclical Pascendi, published in 1907, Fr Garrigou considered that the greatest threat to the Catholic faith was what is called 'Modernism' – that confused effort, made sometimes with good intentions and sometimes with bad, to 'reinterpret' Catholic doctrines in line with prevailing trends in history, philosophy and the natural sciences. Into the combat with Modernism he entered with vigour, attacking not people but errors, and desiring to lead those in error back to the integral truth of the Catholic Faith. Two of the 'great names' of the day with whom Garrigou-Lagrange crossed swords early on were his former professor Henri Bergson and Maurice Blondel. Bergson, now almost forgotten, was then a greatly celebrated Jewish philosopher who seemed to many Catholics a useful ally in the struggle against materialism. Father Garrigou showed that Bergson's writings were incompatible with the Catholic belief that by our concepts we can grasp the unchanging natures of things, and thus can form dogmas that will never need to be revised. In the end Bergson was brought, in part by Garrigou's efforts, to the very brink of the Catholic Church, though he died unbaptised. Blondel was another widely-fêted philosopher who was a Catholic. His explanation of how only Christianity could fulfil the deepest human longings compromised what is called 'the supernatural order': the fact that God by sanctifying grace and the gift of the Holy Spirit raises us infinitely beyond anything that our nature itself requires. 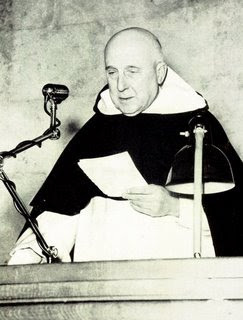 For Fr Garrigou, the distinction between the natural and supernatural orders was of the essence of Christianity – he loved to quote a dictum of St Thomas Aquinas, that "the smallest amount of grace in one person is greater than the whole of creation". One child with a baptised soul is of more value than all the angelic hierarchies, naturally considered. It was because Blondel's ideas threatened to undermine this distinction that Garrigou-Lagrange resisted them. In so doing he anticipated the teaching that Pope Pius XII was later to issue in the encylical, Humani Generis. In his defence of Catholic doctrine according to the principles of St Thomas, Fr Garrigou was greatly aided by Jacques Maritain. Maritain, originally from a markedly anti-clerical family, entered the Church in 1906 and was to become the most brilliant Thomist philosopher of the twentieth century, dying in 1973. Between the two wars, Garrigou-Lagrange and Maritain organised the 'Thomist Study Circles'. These were groups of laymen committed to the spiritual life who studied St Thomas and the Thomist tradition, and who met once a year for a five-day retreat preached by Fr Garrigou at the Maritains' house in Meudon. The study circles were highly successful, and Meudon became a seed-bed of vocations. 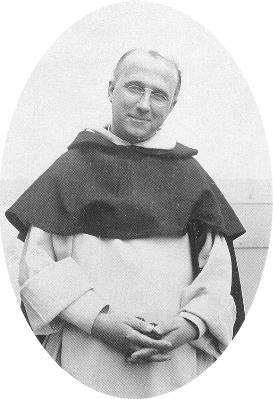 The young Yves Congar, who was later to write somewhat bitterly about Garrigou-Lagrange, was present at some of the retreats preached by the Dominican friar at Meudon, and later recalled: "He made a profound impression on me. Some of his sermons filled me with enthusiasm and greatly satisfied me by their clarity, their rigour, their breadth and their spirit of faith." It is perhaps in this field of mystical, or spiritual, theology that Garrigou's most original work was done. As early as 1917, a special professorship in 'ascetical and mystical theology' had been created for him at the Angelicum, the first of its kind anywhere in the world. His great achievement was to synthesise the highly abstract writings of St Thomas Aquinas with the 'experiential' writings of St John of the Cross, showing how they are in perfect harmony with each other. The one describes the spiritual life from the point of view, so to speak, of God, analysing the manifold graces that He gives to the soul to bring it into union with Himself; the other describes the same process from the point of view of man, showing the 'attitudes' that a faithful soul should adopt at various stages of the spiritual journey. It must have been particularly pleasing for Fr Garrigou when St John of the Cross, whose orthodoxy had once been doubted by some writers, was declared a Doctor of the Church by Pope Pius XI. The other great theme of Reginald Garrigou-Lagrange's spiritual theology was the universality of God's call to the mystical life. He argued convincingly that while the more dramatic mystical phenomena such as visions and locutions are obviously reserved to a few, all the baptised are invited not just to a life of virtue, but to a life of close union with God in prayer. This union is in the most proper sense of the word mystical, since it is founded on the gifts of the Holy Ghost and on our sharing in God's own life by sanctifying grace. He went so far as to say that the transforming union as described by such saints as St John of the Cross and St Teresa of Avila was simply the full flowering of the grace of baptism. 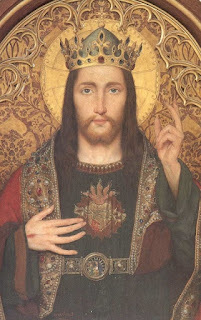 At the same time, Fr Garrigou's writings contain useful warnings against abusing this doctrine, for he often points out that any so-called mysticism not based on the practice of the virtues and on meditation on Christ and His Passion is an illusion. The disaster of world war in 1939 brought a special, personal suffering to Reginald Garrigou-Lagrange: estrangement from Maritain. When France fell, Fr Garrigou, in common with many Frenchmen, continued to recognise Marshal Pétain, the hero of the Great War, as the rightful head of state. It followed that Charles de Gaulle was a mere rebellious soldier attempting to usurp authority. Father Garrigou did not shrink from publicly stating the logical conclusion: objectively speaking, to support de Gaulle was a mortal sin. But Maritain was a Gaullist, and made radio broadcasts from America in favour of the Free French. This practical disagreement was matched by a theoretical one: Maritain had come to advocate a 'pluralist' model of society, in which adherents of different religions or of none would be granted equal freedom of expression and of public practice; a shared 'sense of human brotherhood' would be enough, he argued, to create a basically just society. Garrigou-Lagrange considered that Maritain was compromising the social doctrine of the Church by his writings on this subject, and also that he was overly optimistic about the spiritual state of those outside the Church. He wrote a solemn letter to Maritain asking him to change course, but Maritain, despite the great esteem he had for Fr Garrigou as a theologian and as a man of prayer, refused to do so. The friendship between the two men was wounded, and could not be healed, or not in this life. After the war Fr Garrigou continued to teach in Rome. Over the years, his lecture notes were turned into an impressive array of books, the more technical ones being published in Latin and the more popular ones in French. In particular he commented on St Thomas Aquinas's Summa Theologiæ, taking his place in the line of the great commentators on that work, a line that stretches back to the Middle Ages. All the time, he was conscious, like Pope Pius XII, of how the dangerous tendencies against which he had striven in the days of St Pius X were still alive in the Church, threatening to undermine the integrity of doctrine. A famous article of his, called, 'Where is the New Theology Headed?' was written shortly after World War II. It contains this shrewd comment about Catholics who were unwittingly harming the Catholic cause: "They go to 'the masters of modern thought' because they want to convert them to the faith, and they finish by being converted by them". An interesting remark, perhaps, for these days of inter-religious dialogue. No portrait of Reginald Garrigou-Lagrange would be complete without reference to his religious life. For if he was an internationally renowned professor (and a feared opponent), he was above all a friar of the Order of Preachers. He was known, in fact, for his fidelity to the regular life. Although dispensations from the choral office were readily available in the Dominican Order for someone with his teaching load, Fr Reginald was habitually present in choir. He would have gladly echoed a remark made by St John Bosco to his religious: "Liturgy is our entertainment". We are told that he was very modest in matters of food and drink and that he felt that it was hardly compatible with religious poverty to smoke. His 'cell' at the Angelicum was the most spartan in the priory, with no ornamentation, and a bed that was, in the words of one contemporary, "a pallet and a mattress so thin that it was virtually just an empty sack". It was not that he had no attraction for the things of the senses – as a young man he had learned to love the music of Beethoven, a love that remained with him through life. Yet – as he taught generations of Roman students – ascetism is a permanent necessity in this life, both because our fallen nature inclines us to sin, and also because we have to be made capable of the infinite good which is God. Father Garrigou liked to emphasise that there is no incompatibility between external works such as teaching, preaching and retreat-giving and the monastic life that he had learned to live within the cloister. Following a dictum of St Thomas, he would remark that a friar's external activity should flow "from an abundance of contemplation", especially from liturgical prayer, mental prayer and above all the Holy Sacrifice of the Mass. He was always troubled when anyone seemed to rank action more highly than contemplation, or spoke of the latter as a mere means to an end. He liked to emphasise that contemplation is an end in itself, a higher good, from the fulness of which preaching comes forth. To explain this idea, he would use the analogy of the Incarnation of the Word and man's redemption. From all eternity God willed the Incarnation, not as a means subordinated to our redemption, but as a greater good, from which our redemption would, so to speak, overflow. In short, Fr Garrigou-Lagrange was not only a master of spiritual theology: he lived what he taught. Yet if his vocation lay principally in what are called 'the spiritual works of mercy', he did not forget the corporal ones. In his room he kept a box with the inscription, 'Pour mes pauvres', and into this he would invite his many visitors to put alms. When it was full he might be seen doing the rounds of the city of Rome, distributing the contents to the poor. Father Garrigou had worked in various capacities for the Holy Office from the days of Benedict XV onwards, and in the late 1950s Pope John XXIII invited him to join the theological commission that was preparing documents for the Second Vatican Council. But by this time his strength was failing, and he had to decline. He gave his last lecture at the Angelicum shortly before Christmas, 1959. For the next five years Friar Reginald lived in a serene decline of his mental faculties. As his mind and his eyes failed, this great theologian who had once written so subtly of potentiality and act, of sufficient and efficacious grace, of the inner life of God and the glory of Heaven, would remain in his bare cell or in the priory church, praying his Rosary and awaiting his own transitus. He died on 15 February 1964, the feast of one of the greatest of Dominican mystics, Blessed Henry Suso. Unanswerable questions are the most fascinating. What would Reginald Garrigou-Lagrange have said, what would he have done, if he had lived a little longer with his faculties intact? What would he have thought of the Second Vatican Council, and of the liturgical reform? Might he, like his confrère Roger-Thomas Calmel, have become an early ally of Archbishop Lefebvre in the struggle to maintain orthodoxy? Or would he perhaps, like Cardinal Ottaviani, have spoken once and then resigned himself and the Church to God? Who shall say? A merciful Providence spared him all such puzzles: he had fought the good fight long enough, and he was called home. Let the last word be given to Jacques Maritain. In 1937 Maritain recorded in his diary a disagreement which he had had with Fr Garrigou over the Spanish Civil War. Years later, when Maritain published his diaries, the following note was appended to the passage in question: "This great theologian, little versed in the things of the world, had an admirably candid heart, which God finally purified by a long and very painful physical trial, a cross of complete annihilation, which he had expected and had accepted in advance. I pray to him now with the saints in heaven." I should like to acknowledge my indebtedness for this article to a recent book by an American Dominican, Fr Richard Peddicord, entitled, The Sacred Monster of Thomism. As far as I know, it is the only book that has been written expressly on Fr Garrigou-Lagrange's life and legacy. It is published by St Augustine's Press. Reginald Garrigou-Lagrange wrote 28 books and over 600 articles. His best-known work of mystical theology is the two-volume study, The Three Ages of the Interior Life. This is in effect a summa of his research in this field. Many people, laymen, religious and priests, have found it very valuable. It has recently been reprinted in English by TAN Books. For those interested in apologetics, De Revelatione is an austere masterpiece. It was in large part translated into English in 1926 by Thomas Walshe under the title, The Principles of Catholic Apologetics. A companion work, though more philosophical in content, is God: His Existence and Nature, published originally by St Louis. The same publishing house produced translations (from Latin) of Fr Garrigou's commentaries on the Summa Theologiæ of St Thomas. TAN Books have also reprinted various other of the more 'popular' works of Garrigou-Lagrange, including The Mother of our Saviour and Everlasting Life. These are full of solid doctrine, whilst also being suitable for devotional use. Finally, there is a work called The Last Writings of Reginald Garrigou-Lagrange, published in 1969 by the New City Press. This contains retreat talks given by Fr Reginald in his last years. Anthony Cekada. Work of Human Hands: A Theological Critique of the Mass of Paul VI. West Chester, OH: Philothea Press, 2010. 444pp. This book is a bold, critical study of the ideology underlying the liturgical changes that occurred during the second half of the Twentieth Century in the Roman Rite. Theologically profound and well-researched, it can be seen as an important contribution to ‘traditionalist’ Catholic scholarship. Previous full-length monographs on this subject have focused mainly on criticizing the changes to the Ordinary of the Mass and on chronicling the historical circumstances that led up to them. This study, however, includes not only criticism of the changes to the Propers (variable parts), and in particular an unprecedented account of changes to the Lectionary, but also a ground-breaking theological analysis of the ideological influences that underlie all the changes. Despite the author’s admittedly sedevacantist background, his critique of the New Mass is based exclusively on sound, traditional Catholic theology and is, thus, independent of (or at least logically prior to) his ecclesiological views on the current status of the Papal See. The work is divided into fourteen chapters of roughly equal length. After an introductory chapter that covers the motives and scope of the work, Chapters 2-6 focus on the general history of the recent liturgical changes to the Roman Rite, laying out the ideology behind them. Chapter 2 focuses on the thought of the scholars who headed the liturgical movement that brought about the reform, with particular emphasis on Josef Jungmann and Louis Bouyer; Chapter 3 identifies the Pre-Conciliar Pian Commission and Holy Week Reforms as being continuous in aim and motivation with the Post-Conciliar liturgical reform; and Chapters 5 and 6 deal separately with the 1969 and 1970 versions of the General Instruction of the Roman Missal (or GIRM). Chapters 7-13 then analyze the new Mass point by point, from art, architecture, furnishings, and introductory rites all the way through the dismissal, including both the Ordinary of the Mass and the Propers. The author does this by comparing the salient elements of the New Mass with their traditional counterparts, and citing members of the hierarchy, ‘periti’, and other authorities to reveal the motives behind the particular changes. The book then concludes with a summary of the evidence and a recapitulation of the argument. Except for this overall summary at the end, every chapter ends with a rather helpful, if unconventional, point-by-point summary of chapter contents that adds clarity and cogency to the general argument. The book’s appendix is also worth mentioning: there, Cekada offers a compelling case for the use of the 1951 (or any pre-1955) Missal, rather than the 1962 Missal, an argument that could be well received by traditionalist groups that currently use the latter. The book’s main thesis is that (A) the Mass of Paul VI, said according to its prescribed rubrics as they are found in the Editio Typica of the Missal, is gravely irreverent and destroys Catholic doctrine in the minds of the faithful. Cekada also defends two secondary theses that are corollaries of the first: The Mass of Paul VI, said according to prescribed rubrics, represents (B) a rupture with tradition, and (C) a spurious restoration of the ancient liturgy of the Church. The book can be seen as a 400-page inductive argument to support these three theses. Whereas I can agree entirely with theses (B) and (C), I believe that thesis (A) needs to be qualified significantly. I shall deal with (B) and (C) first, then (A). The author offers strong evidence for his second and third theses, (B) and (C). The theological foundations of Cekada’s overall argument are found in Chapter 2, a true gem on the theological motives behind the liturgical reform. There, Cekada shows that the changes were intended to promote the nouvelle theologie (‘new theology’) of men like Pius Parsch, Romano Guardini, Josef Jungmann, and Louis Bouyer. As operative theological principles of the reform, Cekada specifically singles out the following four: (1) Josef Jungmann’s liturgical “Corruption Theory,” according to which the Roman Rite that was in use in the early 20th Century represented a departure from, and corruption of, primitive liturgical ideals. As a result, the liturgical reform—claims Jungmann—must recover this primitive ideal. Jungmann thus promoted a sort of resourcement in the area of the liturgy. (2) Jungmann’s “Pastoral Liturgy” view, which advocated refashioning the Mass in order to meet the perceived needs of contemporary man—a position that could also be characterized as a sort of liturgical aggiornamento. (3) Louis Bouyer’s “Assembly Theology,” according to which the essence of the Mass consists in an assembly of the ‘People of God’ that, together, celebrates the gathering, the priest merely acting as ‘presider’—a Protestantizing view that bypasses the traditional Catholic doctrine of the Mass as essentially a Sacrifice offered by the priest alone to God, to which the people unite themselves. (4) Bouyer’s theory of “Other ‘Real’ Presences,” which inflates Christ’s presence in the congregation and in Scripture in order to de-emphasize the faith in the Real Presence of Christ under the Eucharistic species—a technique of the reformers that pervades the New Mass and which Cekada calls ‘devaluation-by-inflation’. Whereas resourcement and aggiornamento characterize Jungmann’s principles, a strong ecumenical motivation is evident behind Bouyer’s views. Cekada meticulously shows that these principles are at work in the recent liturgical changes. In Chapters 5 and 6, he shows how Bouyer’s “Assembly Theology” and his theory of “Other ‘Real’ Presences” are the central motifs in the New Missal and the GIRM. He also shows that, for every change that is a supposed to represent a ‘return to the ancient ideal’ (cf., Jungmann’s “Corruption Theory”), the real motive is not a fidelity to antiquity but a desire to abolish a rubric that is doctrinally unacceptable to ‘modern man’ (or to these new theologians). Hence the need ‘modernize’ the liturgy and make it acceptable to ‘contemporary sensibilities’ (cf., “Pastoral Liturgy”). Take, for instance, the “Prayer of the Faithful” or “Universal Prayer”: such prayers did exist in some ancient liturgies, and so the re-establishing of these prayers in the New Mass was presented as a return to antiquity. Yet the original text of these prayers, which the traditional Missal still prescribes for the Mass of the Presanctified on Good Friday, is emphatically un-ecumenical and offensive to ‘modern man’ and to new theology; moreover, they are invariable. The new “Universal Prayer,” on the other hand, is systematically de-Christianized, de-spiritualized, and de-supernaturalized, primarily to placate liturgists who complained that the original prayers had been written “in the direction of a devout and conventional religion, utterly foreign to the pastoral needs of today” (p. 256). In the end, even the de-supernaturalized prayers became optional, and their content is ultimately de-regularized and left up to the discretion of the priest, commercial liturgical publisher, local liturgical planning committee, or director of worship. The result is something that superficially resembles an ancient liturgical prayer (cf. “Corruption Theory”), but which was established to meet the ‘needs of contemporary man’ (cf. “Pastoral Liturgy”) and is, as Gamber puts it, “a novelty which stands completely against liturgical tradition” (p. 257). Another extensive example of antiquity-as-an-excuse-for-novelty is given in Chapter 10, which concerns the changes to the Lectionary. Here—Cekada argues—despite the fact that, thanks to its three-year cycle, the New Lectionary contains more Scripture readings than the old Missal, nonetheless, through ‘adroit choices’ some important Scriptural texts—often a verse or two in the middle of a feast day or Sunday Gospel reading—are bracketed off as optional or altogether omitted, because of their ‘negative theology’, i.e., they doctrinally run afoul of the nouvelle theologie or of ecumenism. Thanks to these omissions, the average Catholic can attend Mass every Sunday for an entire Lectionary Cycle (three years) and never hear theologically ‘negative’ Scriptural passages such as Our Lord’s warnings against hell, St. Paul’s warning against receiving the Body of Our Lord unworthily, his teaching on heresy, heretics and their fate, or his command that women be submissive to their husbands, that they cover their heads, and remain silent in Church. In practical terms, this chapter is perhaps the most devastating for the defenders of the liturgical reform, and it alone, in my opinion, is worth the price of the entire book. Now, Cekada’s main thesis (A), in my view, is not sufficiently nuanced. There are doctrinal problems with the new Missal and GIRM, to be sure; yet, contrary to what Cekada suggests, there is nothing in the Missal or GIRM that could explicitly be identified as heretical. In the 444 pages of the work, Cekada never successfully points to a single explicit heretical proposition in the text of the New Mass, whether in the Propers or the Ordinary. All of the doctrinal problems that he points out consist in omissions, ambiguous phrases, ‘devaluation-by-inflation’, or deficiencies in the many rubrics, expressions, and gestures that make up the Missal and GIRM. Nowhere is a dogma explicitly denied. As far as I could tell, there are only two places in the book where Cekada tries to identify a specific heresy that he thinks is present in the new liturgical reform. One of these is his discussion of the GIRM’s doctrine that the Mass is a re-presentation of the Last Supper. He claims that this is opposed to the Council of Trent’s dogma that the Mass is a re-presentation of the Sacrifice of the Cross. Yet Cekada does not sufficiently discuss or explain why these two notions contradict each other or are mutually incompatible. I do not see why someone who thinks that the Mass is in some sense a representation of the Last Supper must necessarily deny the dogma that the Mass is a representation of the Sacrifice of Calvary. While I do not defend the idea that the Mass consists in a representation of the Last Supper, I would not go so far as to claim it is necessarily a denial of a Tridentine dogma. A doctrinal novelty does not ipso facto involve heresy. There are different levels of theological error—and Cekada is well aware of this—yet he does not discuss whether the doctrinal problems of the new Mass could be categorized as otherwise than heresy. Rather than state that the Mass contains heresies, I would admit that it was clearly motivated by novel doctrines, some of which are obviously dangerous. One could even admit that, in the context of current theological trends, the New Rite may indirectly promote these novel doctrines, and in the minds of most of the faithful these novel doctrines involve a denial of the traditional faith, yet this in no way means that the new Missal contains any proposition or gesture that inherently asserts heresy. Take, for example, the changes to the offertory prayers. The traditional prayers at the offering of the paten and chalice eloquently summarize the Catholic doctrine on the Sacrifice of the Mass, and offer the bread and wine already under the aspect of an ‘Immaculate Victim’ (Immaculatam Hostiam) that will be sacrificed later on, thus making an allusion to the future Consecration. The new prayers, however, do not make reference to the ‘Victim’ or to the Sacrifice. Instead, they are pervaded by a naturalistic tone, as they speak of offering of (mere) bread and wine, which are being considered as the ‘work of human hands’ and which will become ‘bread of life’ and ‘spiritual drink’. This is where Cekada makes his second accusation of heresy: he suggests that calling the bread and wine ‘the work of human hands’ amounts to stating that the matter of the Sacrament of the Eucharist consists in human work, and that this is heretical. Yet, the New Missal in no way states that the matter of the Holy Eucharist is human work. That some theologians read the Missal this way is one thing, but that the Mass itself says so explicitly is quite another. A more reasonable criticism of the new offertory prayers would be that, though not heretical, they simply fail to communicate the Catholic theology of the Sacrifice of the Mass. Perhaps the change was motivated by a novel theology that differed from the traditional theology of the Sacrifice of the Mass, yet no denial of the traditional doctrine is present in the rite itself. Similarly, in the context of current theological trends (e.g., the ecumenical requirement of making the Mass less offensive to Protestants, and the desire of many to abandon the traditional Catholic theology of the Mass), the now-allowed gesture of receiving Holy Communion in the hand may be seen as an indirect attack on our faith in the Real Presence. Yet it is not inherently wrong or heretical in itself to receive Holy Communion in the Hand. Even the old De defectibus prescribes it in certain irregular situations. In itself, this change only amounts to an omitted profession of faith in the Real Presence—an omission that does not in itself imply a denial. So it is in context only, and not in itself, that this new concession can be seen as doctrinally problematic. Interestingly, Cekada also offers two arguments for the invalidity of the New Mass. First, he gives the well-known ‘pro multis’–‘for all’ argument. To my disappointment, Cekada never addresses any of the detailed defenses of the validity of the ‘for all’ translation offered by scholars such as John McCarthy and Manfred Hauke, or even as much as mentions the Vatican pronouncement on this issue. His second argument, however, is more interesting: it is based on one of the criticisms in the Ottaviani Intervention regarding the requisite ministerial intention for saying a valid Mass. The traditional Mass left no room for the priest to be lacking in his requisite intention to change bread and wine into the Most Sacred Body and Blood of Our Lord: the texts made clear what was going on, and what ought to be the intention of the celebrant. The priest who pronounced those words meaningfully and assertively would automatically have the requisite intention. The New Mass, however, together with the 1969 GIRM, present what used to be called the ‘Consecration’ as a mere ‘Institution Narrative’, such that a priest is able to pronounce the new ‘Institution Narrative’ as a mere historical account of the Last Supper without the intention of effecting the Transubstantiation. This would result in an invalid Mass—as Cekada dramatically puts it: “No Body, no Blood, no Mass.” This, in my view, is a theologically sound criticism of the new ‘Institution Narrative’ terminology. Yet this criticism should be tempered by one important clarification that Cekada never makes: this argument applies only to individual Masses where the priest lacks the requisite intention—something that is also possible, though significantly more difficult, in the context of the Old Mass. The criticism does not apply to every Mass said according to the New Missal, for even in the New Rite, a priest who, despite the vague, new ‘Institution Narrative’ language, manages to pronounce the words of consecration meaningfully and assertively, with the requisite intention, bypasses this problem and truly brings about the Transubstantiation. Cekada’s research is, overall, scholarly and profound, eye-opening and convincing. He leaves no room to doubt in the reader’s mind that the creators of the New Mass were seeking to promote doctrines in line with the ecumenical and nouelle theologie movements. Even though Cekada’s main thesis is not simpliciter warranted, the book successfully shows that the New Mass represents a theological novelty, a doctrinal rupture with tradition and a spurious return to primitive liturgy. Inevitably, the book will have to be taken seriously by contemporary theology scholars of all camps. It must be noted that Cekada does not intend to criticize mere liturgical ‘abuses’—violations of the New Missal’s rubrics—that frequently take place in the context of the New Mass. Rather, he explicitly criticizes the new Missal itself as doctrinally problematic. According to Cekada, his view distinguishes him from other traditionalist authors who, he claims, have only criticized ‘abuses’ or who argue in favor of the traditional Mass on the basis of mere aesthetic preference or individual sentiment, and if they ever criticize the New Missal itself, they have merely held it is ‘ambiguous’, instead of acknowledging that it is inherently problematic in its doctrine. I think Cekada exaggerates a bit, however; there are plenty of other works that are critical of the doctrine contained implicitly and explicitly in the New Mass and the new liturgical laws, and not just its aesthetical problems or its ‘abuses’. To name a few of these works: Davies’ monumental, three-volume Liturgical Revolution, the SSPX’s The Problem of the Liturgical Reform: A Theological and Liturgical Study, and of course, A Short Critical Study of the New Order of Mass by Cardinals Ottaviani and Bacci, commonly known as The Ottavianni Intervention. The 1970 GIRM saw itself forced to change the expression to ‘Institution Narrative or Consecration’. Oddly enough, although Cekada thinks the New Mass is invalid, he still thinks it is a sacrilege! Yet, if “no Body, no Blood, no Mass,” then how can it be sacrilege? Cekada appears never to make this connection.